For Apple Watch stand: Put your Apple Watch on the stand at a 45-degree angle to enable the nightstand mode so that you can easily read time and more; Hold apple watch steadily, Don't be afraid of drop out. For iPhone Stand: Keep your device for sturdy, hands-free interaction when Face Time or Skype. The Angle-adjustable phone charging module can offer you a comfortable viewing angle as you need. 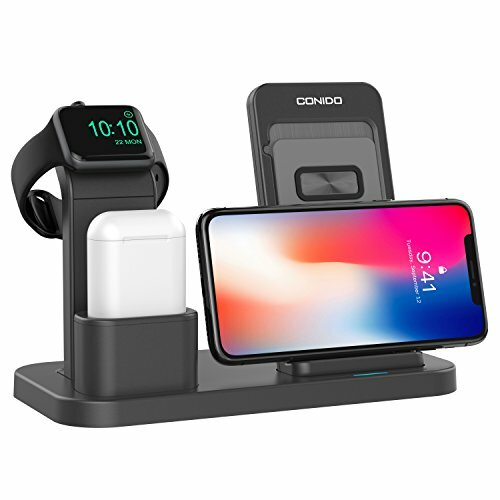 3 in 1 for apple watch Stand & for iPhone wireless charging stand & for AirPods stand, the perfect combination of iPhone charging stand. Compatible with All Qi-Enabled Phone, such as suitable with iPhone X / iPhone 8 / 8 Plus / Samsung Galaxy S8 / S8 Plus etc. NOTICE: IPHONE, APPLE WATCH, AIRPODS, APPLE LIGHTNING CABLE, AND APPLE MAGNETIC CHARGER ARE NOT INCLUDED. Wireless charging function is only suitable for phone, Apple Watch and AirPods still needs charging cables. The TYPE-C ports makes the connection safer, more durable, and more robust. The common chargers are easily damaged by using with the Micro-C port. A complimentary high-quality Type-C cables with product reduce power loss in transmission to ensure adequate charging current. If you have any questions about this product by Conido, contact us by completing and submitting the form below. If you are looking for a specif part number, please include it with your message.